Both Austria and Hungary have witnessed a spike in the number of migrants crossing their respective borders overnight, in a new record number for the countries at the forefront of Europe's refugee crisis. Hungary said more than 3,000 people crossed into Hungary from Serbia from Wednesday night into Thursday morning, while Austria said a similar number crossed into its territory from Hungary. In the eastern Austrian town of Nickelsdorf, thousands are gathered to await trains to Vienna and onward from there to Germany and elsewhere. 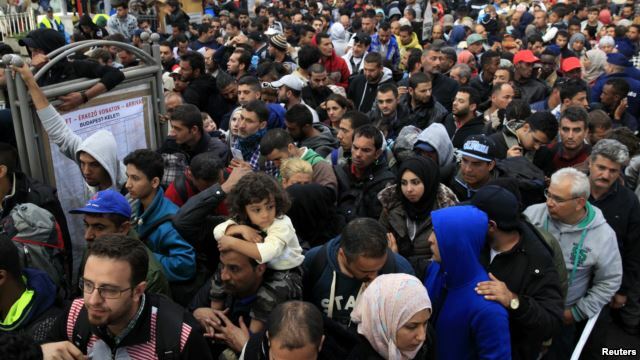 Austrian authorities say they are meeting Thursday to discuss whether to send special trains to the border to transport the refugees to the Austrian capital. Thousands of refugees have been flocking to Austria since it announced last week that it will accept asylum applications, as did Germany earlier in the week. Europe is seeing its strongest influx of refugees since World War II, as people seek to escape violence in Syria, Afghanistan, Iraq, and elsewhere in the Middle East and North Africa. The United States pledged Wednesday to accept more refugees from Syria and elsewhere, while Europe unveiled a mandatory country-by-country quota plan to resettle 160,000 migrants. After meeting with lawmakers in Congress, U.S. Secretary of State John Kerry said, "We are looking hard at the number that we can specifically manage with respect to the crisis in Syria and Europe. That's being vetted fully right now." Shortly after Kerry's meeting, a key member of the U.S. Senate, John McCain, went to the Senate floor to urge stronger leadership from President Barack Obama on stemming violence in the Middle East and North Africa. He stood next to an enlarged, close-up photo of the body of three-year-old Alan Kurdi, a Syrian boy who drowned along with his five-year-old brother and mother when their small rubber boat capsized as it headed for Greece. White House press secretary Josh Earnest said Tuesday the administration has been looking at a "range of approaches" for assisting U.S. allies with the thousands of people arriving from the Middle East, Africa and Asia. European Commission chief Jean-Claude Juncker called for EU member states to take in thousands more refugees over the next two years, but is running into opposition from countries objecting to a quota system. "The Europe I want to live in is illustrated by those who are helping," Juncker told the European Parliament. "The Europe I don't want to live in is a Europe refusing those who are in need." The Czech and Slovak governments held firm in their opposition to the quotas Juncker said are needed to cope with the crisis. Juncker said Europe could not leave Greece, Italy, and Hungary alone to handle the vast influx of migrants. He urged EU interior ministers to endorse the resettlement plan next week. Under the plan, Germany, France and Spain will take in the most, followed by Poland, the Netherlands, Romania, Belgium and Sweden. Slovak Prime Minister Robert Fico expressed concern that terrorists might slip into Europe with the refugees massing on the continent's doorstep. Most of the migrants are looking to settle in more prosperous western European countries, especially Germany and Sweden. "When terrorists are grouping in Syria," Fico said, "how can we distinguish these people from the other migrants who are crossing the borders of the European Union without any controls?" U.S. intelligence chief James Clapper echoed the same worries, saying, "I don't obviously put it past the likes of ISIL ( Islamic State insurgents) to infiltrate operatives among these refugees. So that is a huge concern of ours. "We do have a pretty aggressive program for those coming to this country for screening their backgrounds," Clapper noted. "I am not as uniformly confident about each European country that is going to be faced with welcoming or allowing refugees into their country."